This is a day late, so sorry Team Fedora! It’s because I was watching Star Wars during the cut-off time… hehe. Watching The Force Awakens tomorrow. I’m so excited! I used all three prompts from this challenge and one from the previous. The writer of this diary is Marilyn Borse, a nobody. Just a simple girl trying to help others, like my best friend Andrea. But this entry isn’t about me. It’s about Andrea Madrick, of course. Who’s Andrea Madrick, you ask? Well, like I’ve mentioned before, she is my best friend. We’re about the same age, though Andrea’s a tad bit younger. I love going over to Andrea’s house, for her life is so full of happiness and joy. She has the most loving parents in the world, and sometimes, I’ll admit that I envy her. I’m living with my great aunt Kay, who is a good person – really, she is, or she tries to be – or perhaps she’s at least good at heart. But it’s hard to imagine Andrea needing help, isn’t it? On the surface, it looks like I’m the one needing help. But as glorious as Andrea’s life seems, there’s one little thing about her life that casts a dark shadow on the light of her happiness. 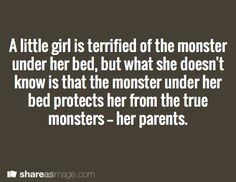 No matter how much her parents console her, no matter how much she tries, she cannot shake the unwavering fear that there is a monster under her bed. Oh, there; Aunty Kay is calling me now. I must go, but I will be back. I am back, a day later. Aunty Kay sent me to the next town over to pick up some goods from the market, which was an overnight trip, but I’m back now. Shall I continue telling you about Andrea? Like I said before, she’s absolutely terrified of the monster under her bed. She’s old enough to know that it isn’t real, I suppose, but something has her convinced that it most definitely is real. I want to help her, I really do. I’ve tried consoling her but she is stubborn about her belief – her dreaded fear. Today, I am going over there and showing her once more that there is no monster under her bed. If Aunty Kay will let me, I will sleep over, too, just to prove it. Wish me luck! What a crazy turn of events has happened these past few days. I slept over at Andrea’s house the night of the 17th. I went there to prove there was no monster under her bed, but my time spent at Andrea’s house proved only a more terrible thing: Not only is the monster real, so very, very real, but it protects her from the real monsters – her parents. Her parents? You ask. I thought you said they were the most loving parents in the world! They were. Or they used to be. On the surface, that’s what it looked like, and perhaps for a time they were. But something happened. Something absolutely tragical happened that I thought wouldn’t play a relevant part in this story, but it does, dearest diary. It really, truly does. Andrea’s mother had a little baby boy about two years back. When the baby was two weeks old, it caught a terrible fever and died. It wasn’t Andrea’s fault, but the parents blamed her anyways. Had they so little misery that they created more? No, they were in a state of great distraught and hurt, and they still created more for Andrea. And the terrible thing is, nobody can stop them. What? That was it? I flipped through the rest of the diary, but every single one of the rest of the pages had been ripped out, like somebody didn’t want anybody to know what this girl had written so long ago. I sighed, putting the diary down. Would I ever know what happened to Andrea, Marilyn, and the lion monster Ski? I went over the five minute stopwatch by a minute and one second. Oops. 😕 I’m really surprised at how this turned out! Thanks, AA, for creating FFWC! I had so much fun!